An increase in suspicious activities along with endangering our youth seems to be occurring in the door-to-door magazine sales industry. We are hearing horror stories that the young people hired to do the jobs are either not getting paid, are withheld from meal tickets and are sometimes made to sleep on hard floors should they not meet their daily quota's. We, at LostNMissing, Inc. are asking that all parents be aware of this potential crime against young adolescents hoping to make a "break" into the world. They are promised travel. Which sometimes they are provided. They are taken from their home states and usually to another state further away. 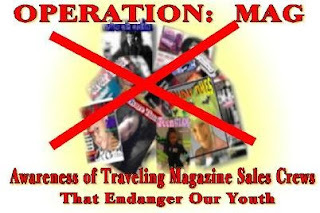 They are "trained" on the magazine sales and dropped off on street corners to go door to door to sell the magazines. 2. Would you like to have me call your parents for you? 3. Are you being fed? 4. Are you being paid for your sales work? 5. Can you go home on your own free will if you choose? Should they divulge to you that they are "in trouble", please phone your local police right away. You just may be their only savior. The Better Business Bureau has written an article in May 2009 warning consumers of door-to-door fraudulent magazine sales. In the same article, they talk about how the young folks are also "at risk". Skull found in woods in upper state New York has been identified as Jennifer M. Hammond. She went missing in 2003 while doing door to door magazine sales. 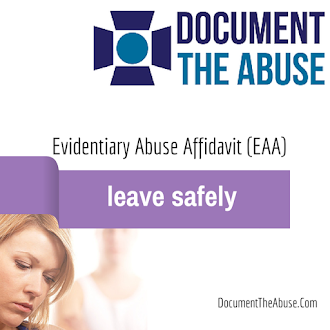 This is not to say that her employer had anything to do with her missing status or death, however, it does point towards the dangers of vulnerable young adolescents being away from their familiar surroundings and knocking on doors of unknowns. Prayers they find whomever caused the death of a young woman only wanting to make a living. October 2009: When two young men wanted out of magazine sales, they were beaten with bats and brass knuckles in their motel room. Two were hospitalized and 6 men arrested. A horrific van crash of a group of young magazine sales team.The driver bolted from the vehicle and was unlicensed. Drugs and alcohol played a role, as well. Sentencing was 7 years in jail. One year for each death. Alcohol and drugs to minors was eliminated from the ad. The below is the van from the 1999 Janesville, WI crash scene. Peter Christman, Cory Hanson, Amber Marie Lettman, Crystal Faith McDaniel, Marshall Lee Roberts, Malinda Lillian Turvey, Joseph Wild all killed in the van crash in Janesville, Wisconsin. They were young magazine sales youth. 5 others maimed for life, one a quadriplegic 15 year old girl.